DIRECT FROM LOURDES - Confirmation Card & Rosary Set. 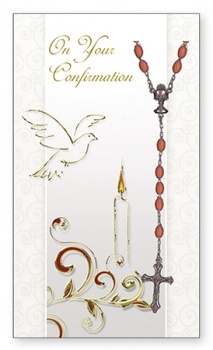 Confirmation Card & Rosary Set. On your Confirmation day.May God be there beside you, and may the Holy Spirit always be a light to guide you. Size 11.5 x 17 cm with red plastic rosary beads.